NYFA Polar Elite 16u had a successful outing this past weekend at the Stars and Stripes tournament in Chambersburg Pa. They went 4-1 to finish in second place in the tournament. Second pool play game would see the first seed of the tournament Maryland Hot Shots United. First inning Liv Prosser had a two out single. Rebekah Wiley and Libby Dunlap both followed with a walk to load the bases. Amy Sheeley was hit by a pitch which scored Prosser. Maddie Reever would reach with an error that allowed Wiley to score. Putting us ahead by 2-0 after the first inning. In the second inning, Hailey Madara led off with a hit by pitch. Emily Oldacker and Hailey Irwin would follow with walks to load the bases. Maya kemper also received a walk to score Madara. Olivia Prosser hit into a fielders choice to score 2 more. Rebekah Wiley had an RBI single to score another in the inning. Led 5-0 after 2. Third inning. Maddie Reever started us with a one out single. Carly Campana received a walk. Hailey Madara hit a fielder’s choice to advance the runners. Emily Oldacker had a 2 RBI single. Hailey Irwin would hit to advance Oldacker. Maya Kemper was hit by pitch to lad the bases. Liv Prosser then had 2 RBI double. Led 10-0 after 3. Maddie Reever pitched 3 innings with 2 hits against. But 3 of the 4 runs scored against were with fielding errors. Maya entered half way through the third to close us out for the remainder of the game. Maya had 2 strike outs and 1 hit against. Final score of the game was 10-4. This allowed us to go in to bracket play on Sunday as the first seed in the pool. Sunday started with our first bracket play game against Chanceford. First inning we lead off with two walks with Abby Hursh and Maya Kemper both reaching. Alyssa Mackay would receive the RBI on a fielders choice. Emily Shearer would get a hit for an RBI single. Score after 1 was 2-0 Elite. Second inning would have hits from Hailey Madara and Carly Campana but we would let them stranded. Score remained 2-0. Third inning Chanceford bunted with 2 outs and reached on an error. Then an RBI single scored that run. Score after 3 is 2-1. Fourth inning remained scoreless. Maya Kemper finished the game in the 4th and 5th inning with 6 strikeouts to end the game. Alyssa MacKay through 3 had 4 strikeouts and gave up one hit. First inning Game Changers would score a run with two hits in the first. Abby Hursh and Maya Kemper both had hits for Polar elite but we would leave them stranded. Score after 1 was Game Changers 1 Elite 0. In the Third Abby Hursh would get another hit and be stranded again. Score still 1-0 after 3. In the fourth inning we would start the inning with Emily Shearer hitting a triple to lead. Libby Dunlap reached on an error allowing Shearer to score. Amy Sheeley had an RBI single which scored Dunlap. Alyssa MacKay would hit a double and have an RBI scoring Sheeley. Maddie Reever and Hailey Madara reached on walks. Abby Hursh hit into a fielders choice that scored MacKay. Score 4-1 after 4th. Chanceford would score in the top of the fifth on an error. Maya Kemper would finish the fifth with a strikeout and game would end with time expired. Alyssa MacKay through 3 innings would have 3 strikeouts 2 hits and one earned run. Maya Kemper through 2 would have 3 strike outs 1 hit and 1 unearned run. This would lead us to the championship game. Where we would have a rematch from our pool play game the day before with Hot Shots united. First inning Maya Kemper had a hit and we left her stranded. Hot shots would not score. 0-0 after 1. Second inning Libby Dunlap had a double and Maddie Reever had a single. And again we left them stranded. Hot Shots would score 1 in the second with a leadoff walk and a double. Score 1-0 end of 2. Third inning Hailey Irwin had a hit and we would leave her stranded. Hot Shots scored with a 2 out single. We gave up four runs in the third on fielding errors. Only one earned run in the inning. Hot shots 5-0 after 3. Hot shots would again score on a single and a throwing error. Score 6-0 after 4. 5th inning would remain scoreless for both teams. Then in the top of the 6th Hot shots had 2 hits and left them stranded. Bottom of the sixth with time expired we would have our last at bat. Emily Oldacker led off beating out an infield hit to lead us off. This sparked a fire under our bats. Hailey Irwin would bat next and get a single. Abby Hursh would single for an RBI. Alyssa MacKay would receive a walk. Emily Shearer had a long fly ball sacrifice that would score a run. Libby Dunlap would reach on an error to score two more. Final score would be 4-6 coming up just short. Alyssa MacKay pitched 2 2/3 with four strike outs and four hits against. 1 earned and 4 unearned runs. Maddie Reever would pitch 1/3 with 1 strike out. Maya Kemper would pitch 2 innings with 3 strikeouts 4 hits and 1 unearned run. Finishing second in an 18U class C tournament. They battled through the extreme heat to pull out a successful showing and finishing second. The NYFA Polar Elite 16u team traveled to State College this past weekend for their first two day tournament of the season. Entered as the only C team in what would be combined as an open class tournament, they were not sure what to expect. In pool play they faced Armstrong Force, a class A team, in their first game of the day. Down 2-0 heading into the sixth inning, with 2 runners on, Emily Shearer had a triple with 2 RBI’s. Maya Kemper would hit to score the go ahead run in the 6th inning. Tough defense and strong pitching allowed the game to finish with Elite victorious 3-2. Abby Hursh had 2 hits in the game. Maya Kemper pitched the complete game with 9 strike outs and only 2 hits. The 3rd pool play game of the day was against FORCE! from Allentown. Alyssa MacKay and Maya Kemper pitched a strong game, allowing only 4 hits. FORCE! scored 3 runs early and then our pitching and defense shut them down. In our last at bat of our game, we came up short scoring 2 runs. With runners on, Olivia Prosser bunted to move runners to 2nd and 3rd. Amy Sheeley had an RBI to score our first run and Libby Dunlap would score on a passed ball for the second run. The game would end with a runner left on base and score of 3-2. A hard fought loss. The fourth and final pool play game came early Sunday morning against another tough team, the Delaware Valley Senators. The Senators would get a jump on the score early. Though we had tough pitching and defense, they took advantage of every opportunity to score. Late in the game we showed a bit of life on offense as Alyssa MacKay hit a two-run home run to put runs on the board. We lost 8-2. We would complete our pool play finishing 3rd in our assigned pool. We ran out of steam in the first round of championship play, losing to a very tough Centre Hailstorm team. 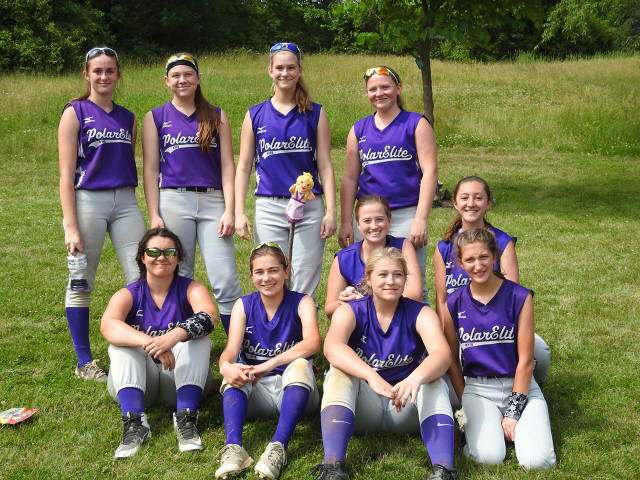 Polar Elite finished 2-3 on the weekend, good for 9th overall in the field of 16 teams. 16U Travel Tryouts Have Closed!